As consumers continue to get more comfortable with shopping online and using mobile to do it, retailers will need to make sure they have a well-designed mobile website to cater to these shoppers. As consumers grow more comfortable, they will also grow more mobile savvy. Retailers who keep this in mind will be ahead of the curve. 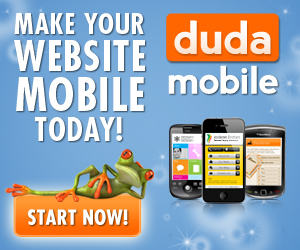 Check out our Dudamobile Reviews to learn more about online mobile website builders. A big part of staying ahead of the curve means anticipating your customers’ needs and then designing a mobile website to meet or even exceed those needs. A mobile website that is easy to navigate even while on the go is a definite plus. The consumer should be able to find information quickly and easily, including contact information for the closest store. A great mobile strategy is to have a button for the consumer to click on that dials the store for them. Another good mobile strategy is to make sure the customer can see the store’s online inventory so they can quickly make buying decisions. The shopping feature of a mobile website should be the best designed aspect of the site. Mobile apps for retailers can help, but keep in mind that a shopper who is on the go is less likely to download an app than they are to just access a mobile website. Retail text message marketing can bring in consumers in higher numbers if it’s used right. Sending out coupons or other offers through SMS marketing is a great way to increase retail traffic. Once a consumer responds to SMS marketing, the retailer has a way to easily see how well the SMS marketing is working. They also have a way to keep contact with that consumer and extend further offers and customer rewards. Mobile Marketer reports that at the minimum, consumers are now expecting major brands to have a mobile site. They also expect a mobile site to be a different experience from a desktop site. A mobile experience is viewed as more personal, because a mobile device is like an extension of the person using it. Morgan Stanley reports that 90% of mobile users have their device within three feet of themselves 24/7. This is why mobile has a more personal feel than a desktop. Retailers who develop a mobile marketing strategy that capitalizes on mobile’s one-on-one feel will be able to succeed as mobile use grows.